The morning started with a nice surprise: for only the second time during my stays here my house guest got up before me and bought our morning baguette. At first I was puzzled at my good fortune, then I realized that Jared has been reading my blog and noticed the remark I posted when Brian did the same last week. It felt a bit odd — but not unpleasant — to realize that what I write here has the potential to affect my future experience as well as recording my past. Since it was a lovely day we decided to spend it outdoors. Our first stop was the Hôtel de Ville to pick up Jared’s Vélib’ card. Thus began a SNAFU that lasted nearly all day. The folks at the Hôtel de Ville told us that the card had to be registered on the Internet. I couldn’t get the wifi system at the Place des Vosges working but eventually he was able to register on my phone at another park. When we finally decided to bike home, however, at first we couldn’t find a working bike, even after visiting several Vélib’ stations. Then when we did find a couple of bikes the station would not accept his registration. To make a long story somewhat shorter it turned out that (1) the confirming email had gone into his spam folder, (2) it said that his registration wouldn’t be effective until a specified time that afternoon, (3) when he tried again after the specified time his account was locked due to too many failed attempts, but he was able to speak with a Vélib’ rep from the station who fixed the issue, and (4) to add insult to injury it turns out that you don’t need a card at all for a one-week membership, only for longer terms (like my own annual membership). 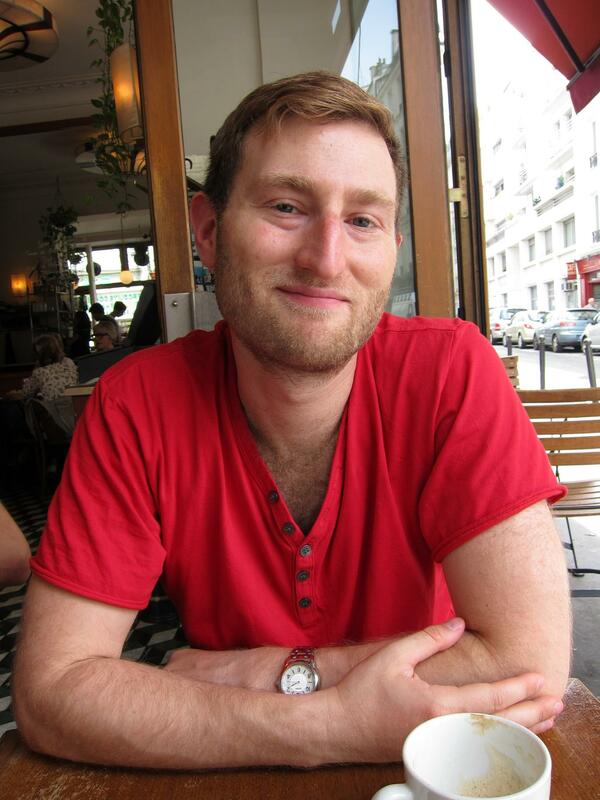 The multiple failures during the day had cast a pall on Jared’s mood, which lifted noticeably after he took his first bike on a maiden ride around Montogueil. While there was a happy ending concerning his membership this did nothing to ameliorate the issue of all the bikes being taken from so many stations: a problem of success, but still a problem. We got falafel — which Jared remembered fondly from prior trips — from one of the take-out places on rue des Rosiers in the Marais. There was a weird moment as we ordered. I noticed a 50 euro bill on the sidewalk, under the foot of the young man who was taking our order. As I picked it up Jared said something about my having dropped it, even though neither of us saw where it came from. I assumed the young man had dropped it so I gave it to him. He took it and gave us 40+ euros change. No hypothesis fully fits the facts, but my best guess is that I had put the bill loose in my pocket a few nights before, since I was going to a sketchy nightclub opening and didn’t want to bring my wallet. Either that or we got very lucky — and someone very unlucky. We munched as we walked, in true American fashion, then finished up on a bench at the Place du Marché–Sainte–Catherine, a little out-of-the-way square that I had stumbled on my first year. I then played one of my standard friendly tricks by walking Jared down to rue Saint Antoine, then suggesting we duck into the Hotel de Sully so I could wash the falafal sauce out of my beard. That took us through two lovely courtyards and then — surprise! — right onto the Place des Vosges. As a mathematician Jared particularly appreciated the eight-fold symmetry of the square. My eye was drawn, however, to the lovely fountains. 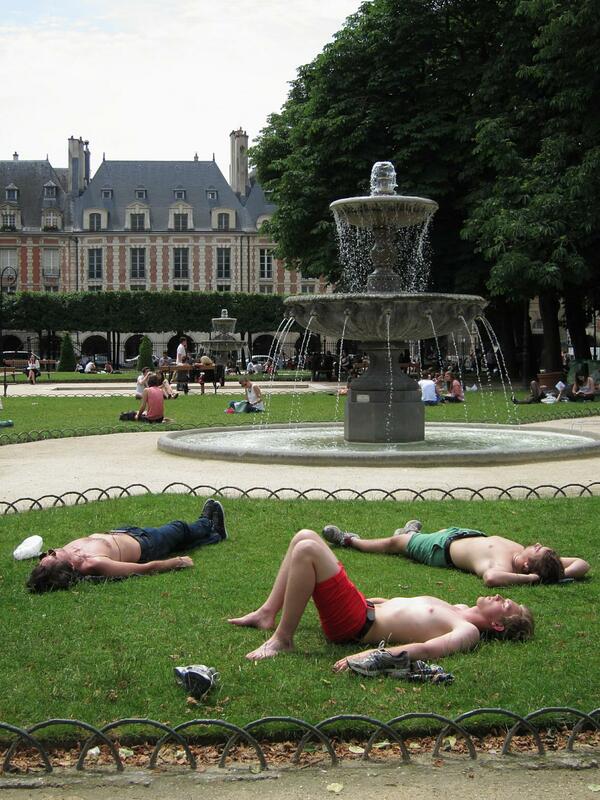 Lovely fountains in the Place des Vosges. After lunch we got coffee on rue de la Roquette, at La Fée Verte (this is a slang term for absinthe, but it was still a bit early in the day). I ordered une noisette for myself but I couldn’t remember the term for the other type of coffee with milk so I asked sheepishly for a « grande café-au-lait » for Jared — realizing that this French-ish Americanism isn’t used in France. All went well until we wanted the check; I could not catch anyone’s eye despite lots of meaningful looks and writing in the air; finally I went up to the counter and demanded my addition. Strangely, the handsome waiter, who had not once looked our way for the previous ten minutes, then became very friendly. He asked where I was from, commiserated about the Boston bombings, and explained the two terms for coffee with milk: une noisette (an expresso with a dash of steamed milk) and un crème (masculine because café is implied even though crème itself is feminine). Possibly verging on linguistic TMI, he further explained that some misguided French people order un noisette, for the same reason, but that this is erroneous. Jared at La Fée Verte with the last of his (masculine) crème. We explored some of the cool little bobo streets around Bastille, walked up Avenue Parmentier (with an obligatory stop at the odd doll repair shop I had photographed in 2011), then headed up rue du Faubourg du Temple and rue Belleville (as Lisa and I had done on our first epic flâne), with side trips down the legal grafitti street, rue Dénoyez, and other odd by-ways. Eventually we hung a left and stepped into the park that Jared had heard — not inaptly! — as Parc des Buttes-Charmante (the park of the charming hills). It was the third time this year that I had introduced a friend to the park, but the experience didn’t seem old in the least; I love the place and each time I see it anew through my guests’ fresh (and usually wide) eyes. 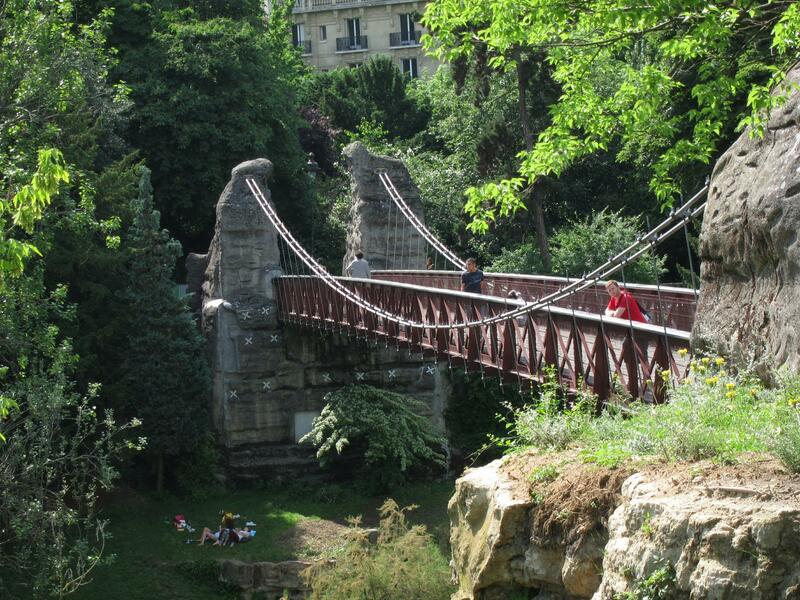 Jared on the suspension bridge at the Parc des Buttes-Chaumont. 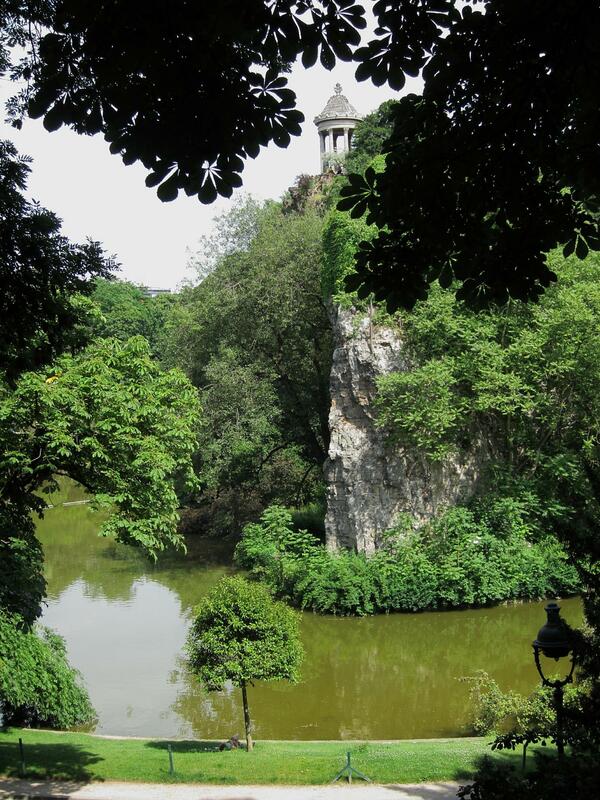 The lake and Temple de la Sibylle at Parc des Buttes-Chaumont. Due to my mix-up we arrived at Le Sentier des Halles half an hour before I had intended, but there was already a line (actually an orderly crowd) so it was probably a good thing. The show, by a two-man drum group called Fills Monkey, was terrific — fun for kids as well as adults, and completely language-independent. I was very glad, however, that Jared snagged me a set of ear plugs from a bowl in the lobby since I had forgotten mine and I would otherwise have been unhappy with the volume. After the show we had a very nice meal, served by yet another beautiful and friendly waiter, at Lézard Café. I was initially bemused to be given the English menu, but I had to agree with Jared’s observation that neither of us would have known to avoid the gizzards if we had gotten the French one. We were careful not to have too much wine, so as to still have enough thirst to finish the evening with a couple of beers on the terrace at — where else? — L’Open Café. A slightly less benignant effect of having read my blog was that Jared wanted to top the mileage I had racked up during my walk in the country on Saturday. I was skeptical that we would achieve this — and of course the point is the texture of one’s experience rather than the distance walked — but at the end of the day it turned out that we had set a new record, of 13.34 miles, by less than 100 steps. Mot du Jour: « gésier ». Gizzard.